The Mardi Gras festivities have already commenced in New Orleans in preparation for the big Fat Tuesday celebration on Feb 12th. On this day, the city gathers in the French Quarter to welcome the Mardi Gras parade where hundreds of local businesses and organizations come together to show off their beautifully extravagant floats, throwing colorful beads and doubloons to the spectators in the crowd. 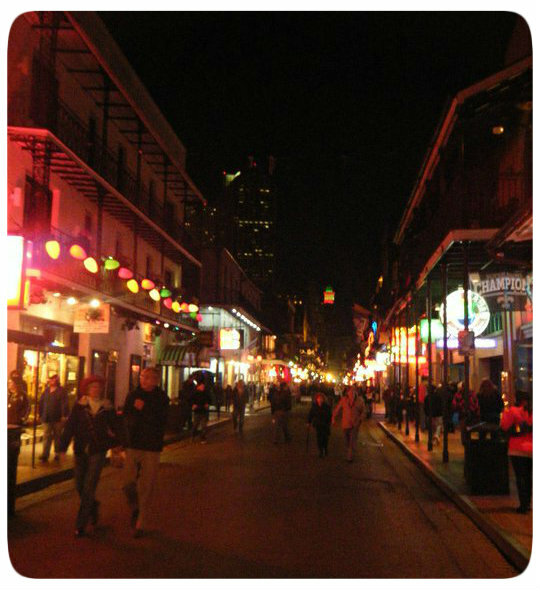 After the parade, the town rushes off to Bourbon Street to continue the endless festivities of eating, drinking and enjoying some of the best live music around – from jazz to latin to blues and reggae. I’ve been to a few Mardi Gras themed parties here in the “Golden State,” but have never truly appreciated the deep history and traditions that surround this day until I met my neighbor, Morgan. Morgan and her family have been deeply rooted in the Louisiana culture since the early ’70’s. Being born in Louisiana herself, she has always had a strong affinity to the Cajun culture and considers Mardi Gras one of her favorite holidays. As we got to know each other better over a glass of wine, she began to share with me the many southern traditions and family memories that have always been part of her life. Although her family moved to North Carolina when she was young, they continued to embrace the Cajun traditions through the medium of food, dialect and music. Many mornings began with beignets and café au lait, the infamous Café Du Monde’s specialties. Gumbo, jambalaya, red beans and rice, muffaletta sandwiches, crawfish and ētouffēe are common dishes seen at the dinner table with jazz music playing in the background. People often order New Orleans crawfish from all over the states to be shipped overnight for varies parties and gatherings. Morgan’s Aunt & Uncle, who live in Colorado, fly in Louisiana crawfish every year for their crawfish boil – an annual family tradition. 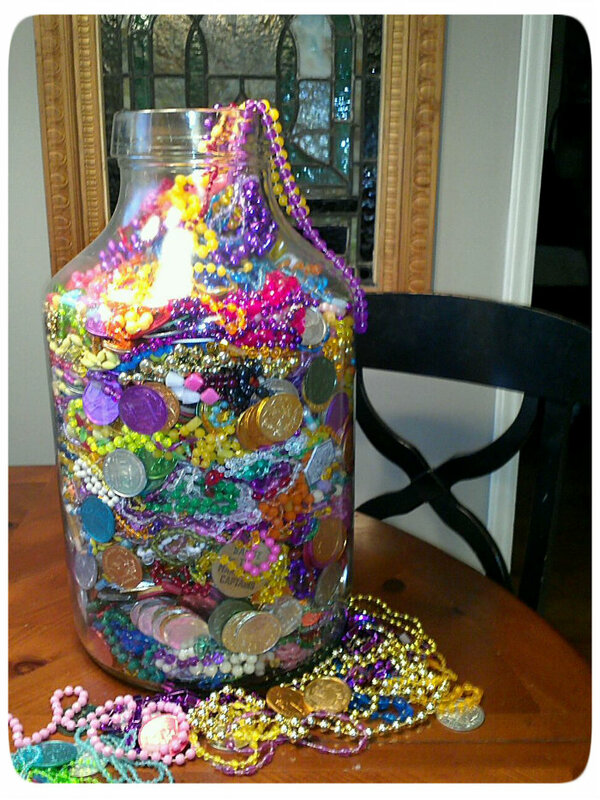 Mardi Gras doubloons & beads are some of the treasures thrown from floats during the parades in New Orleans. Doubloons are a particular favorite with collectors because they have dates on them, and can be identified by krewe emblems. One of Morgan’s fondest memories as a little girl was playing with a jar full of colorful beads and doubloons that were collected by her grandparents over the years. This jar was handed down to her and is now one of her most prized possessions. As we continued to chat, and another glass of wine later, Morgan shared with me a unique Mardi Gras tradition that she enjoys making with her family each year: Homemade King Cake. “King Cake?” I asked, never heard of it. This traditional holiday treat is a ring shaped breakfast cake covered in icing and topped with green, gold and purple sprinkles along with an array of other decorations such as beads and doubloons. The most essential part of the cake is the little plastic baby cooked inside it. It symbolizes a fresh start and if you receive the baby in your slice you are deemed good luck for the whole year. If you are fortunate enough to receive this luck, it’s your turn to make the cake for next year’s festivities. I now have a new appreciation for the holiday that I once thought nothing more of than just a day of parties, beads, colors and masks. Making some of the traditional fare this weekend with Morgan was a ton of fun, and the recipes were delicious and so easy to make. I hope you enjoy this little bit of “Mardi Gras” and southern culture through the recipes below. Mix water, sugar, and yeast in a large bowl and let sit for 10 minutes. In another bowl, beat the eggs, salt and evaporated milk together. Add the egg mixture to the yeast mixture. In a separate bowl, measure out the flour. Add 1 1/2 cups of the flour to the yeast mixture and stir to combine. Add the butter and continue to stir while adding the remaining flour. Remove dough from the bowl, place onto a lightly floured surface and knead until smooth. Spray a large bowl with nonstick spray. Put dough into the bowl and cover with plastic wrap or a towel. Let rise in a warm place for about an hour. Add oil to a large, heavy pan and heat on medium (make sure to cover the entire bottom of pan with oil, about 1/2 inch.) Roll the dough out and cut into 1-inch squares. Add dough to oil and fry for about 2 – 3 minutes or until golden brown and flip. Cook for another 1 – 2 minutes. After beignets are fried, drain them for a few seconds on paper towels, and then sift confectioners’ sugar over beignets. Makes 1 1/2 dozen. Enjoy beignets with cafe au lait: steam milk and add to coffee. Add oil to a large stock pot, just enough to cover the bottom. Dice the first five ingredients and add to pot. Season with salt and pepper. Simmer for about 5 minutes. Add the bay leaves and grated garlic. Simmer for 3 minutes. Add the rice and stir with the other ingredients in pot, melding the flavors together. Let sit for about a minute and then add tomato paste, chicken broth and bring to a steady simmer. Cover, slightly reduce heat and cook for 20 minutes. While the rice is cooking, coin slice the sausages and saute until slightly brown, about 5 – 6 minutes. Test rice, if done reduce heat to low. Add the shredded chicken, sauteed sausages and spice mix. Stir and let ingredients cook on low for another 5 minutes. Remove bay leaves and serve immediately. This is a twist on the traditional King Cake, incorporating a delicious cream cheese filling. To make a traditional King Cake, omit the filling and sprinkle cinnamon-sugar on top of cake before baking. Stir together first 3 ingredients. Stir in 2 tablespoons milk, adding additional milk, 1 teaspoon at a time, until spreading consistency. Cook first 4 ingredients in a medium saucepan over low heat, stirring often, until butter melts. Set aside, and cool. Stir together yeast, water, and 1/2 tablespoon sugar in a measuring cup; let stand 5 minutes. Beat sour cream mixture, yeast mixture, egg, and 1 cup flour at medium speed until smooth. Reduce speed to low, and gradually add enough remaining flour (2 to 2 1/2 cups) until a soft dough forms. Lightly flour surface and knead until smooth and elastic (about 10 minutes). Place in a well-greased bowl, cover and let rise for about an hour. Punch down dough and roll into a long rectangle (make sure it’s long enough to fit around entire bundt pan*). Beat 3/4 cup sugar, cream cheese, 1 egg, and vanilla until smooth. Spread cream cheese mixture evenly on dough rectangle, leaving 1-inch borders. Roll up dough rectangle, jelly-roll fashion, starting at 1 long side. Before sealing, place the plastic baby into dough and close. Place dough roll, seam side down, in a lightly greased bundt pan. Bring ends of roll together to form an oval ring, moistening and pinching edges together to seal. Cover and let rise in a warm place for 20 to 30 minutes or until doubled in bulk. Bake at 375° for 14 to 16 minutes or until golden. Slightly cool cake on wire racks (about 10 minutes). Drizzle glaze evenly over warm cakes; sprinkle with colored sugars, alternating colors and forming bands. Let cool completely. *Don’t have a bundt pan? No worries! Form dough in a ring shape and place on a lightly greased cookie sheet. So how do you make an authentic Pat O’Brien’s Hurricane cocktail? Click here to find out. That jambalaya looks so delicious!! Seshat, thank you. It is delicious – full of flavor and so easy to make! Let me know if you end up making it, I would love to hear your feedback. Cheers. Definitely! I may probably do that. I’ll keep you posted. Meanwhile, keep up the good work. 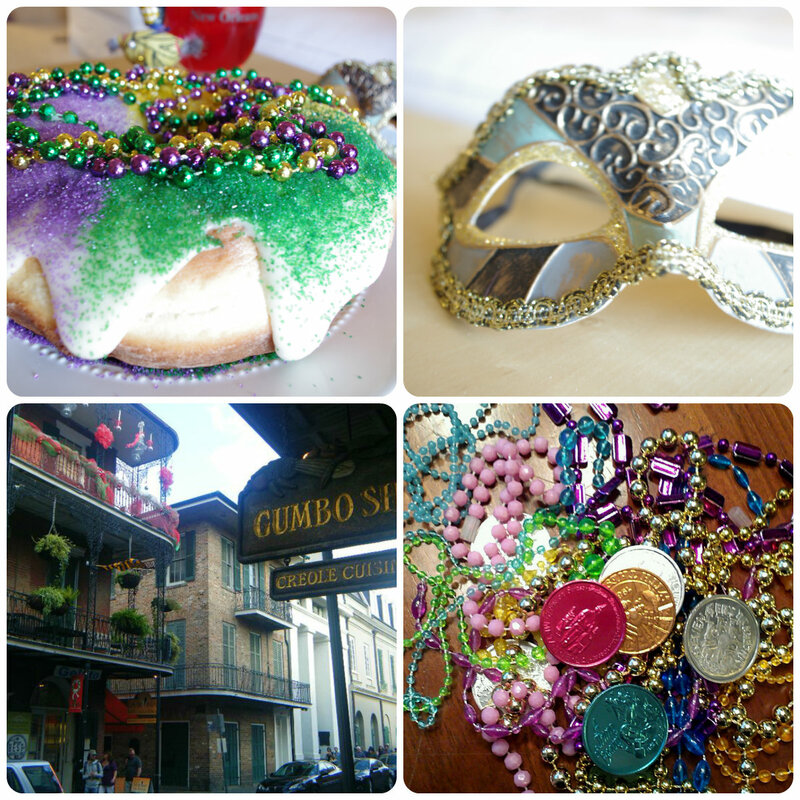 Love your Mardi Gras blog! Thank you Wynne, I had so much fun learning about your families traditions. Oh and the food…out of this world delicious. Meme – Yes! It was a wonderful day of learning and fun. All three recipes came out great. 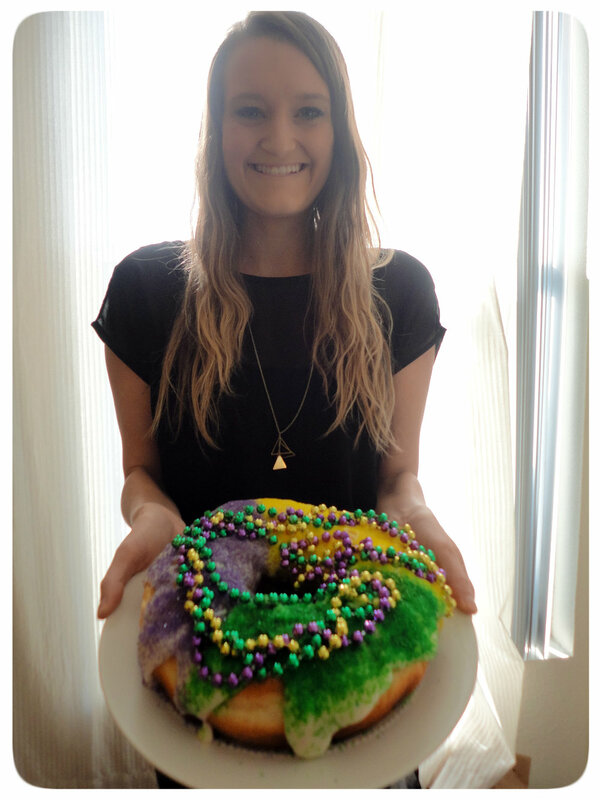 Let me know if you plan to make the king cake, it’s fabulous!